After having read good reviews about it on Big Wayner and Oshawa Ogre, I was really keen to taste this sauce and Richard, owner of Dimples, kindly sent me a bottle overseas to review it. I admit I like squeezable bottles because it’s handier when you wanna pour over meat or plate, but I like how this massive glass bottle looks. Moreover, the label with the smiling pig is really cute (even if I doubt that pigs laugh at the idea of being grilled), so cute that I decided to save a pig and test the sauce with beef and chicken instead. Its smell is quite mouthwatering, mostly smoky and vinegarish. At that point, you can guess that it’s going to taste what it smells… let’s find out ! But first, a quick look at the sauce: pretty red/brown color, it’s quite smooth but lacks a bit of big chunks, it’s quite thin without being watery. Straight out from the bottle, the sauce starts strong. A fruity flavor hits the mouth followed by the taste of vinegar. It has the right amount of sweetness that cuddles the tongue without attacking it. The smoky flavor is there but quite discrete though. Despite being tasty, the taste fades out a bit too fast and lacks depth. And there comes the drawback of the big glass bottle, with sauce all around the bottleneck. 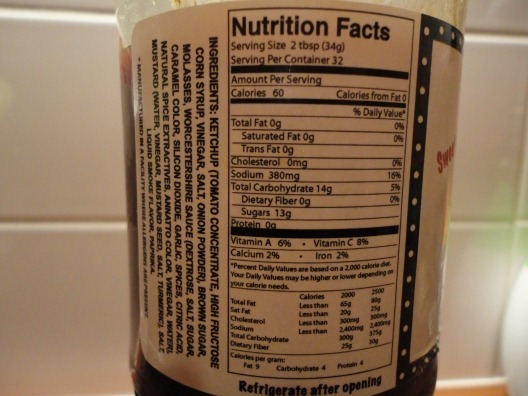 The sauce contains lots of ingredients, and unfortunately HFCS ketchup and artificial colors. I tested it as a dipping sauce with a grilled strip steak, it was good, the meat and sauce were quite complementary because the sauce didn’t cover the taste of the meat. Then I smoked chicken thighs and basted some sauce on them at the end of the cook and they turned great. The sauce has the right consistency, easy to baste and it sticks well to the meat. Warm, it doesn’t lose its taste and I perceived more the smoke flavour. I served the thighs with stoemp (a Belgian speciality made of mashed potatoes and carrots), which I usually eat with ketchup or KC-style sauce, but this one goes well with vegetables too. 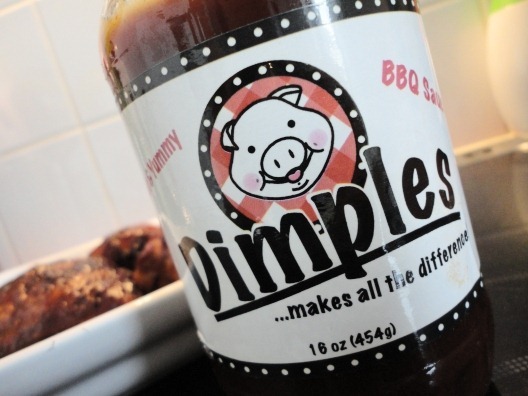 If you want to find resellers or buy the sauce online, visit their website at http://www.dimplesbbqsauce.com/, you can also like their Facebook page. Nice work on this Nick! Even though English is not your primary language, you’ve got a great way with words and you come across as accurate and honest and trustful. Really happy to have your stuff on the site!